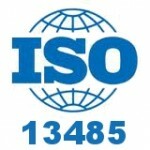 ISO 13485, Medical devices–Quality management systems–Requirements for regulatory purposes, is a global standard that establishes requirements for a quality management system. Take this test to see how well you know the basics. We’ll post the results in a couple of weeks. Good luck!